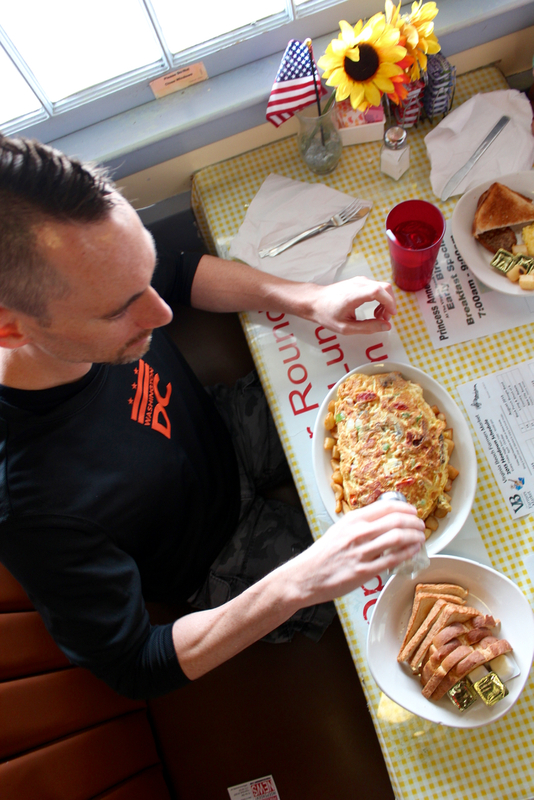 LANDSTOWN — The brave, having ventured to Princess Anne County Grill at the Virginia Beach Farmers Market, tuck in to a giant meal called Eggzilla. 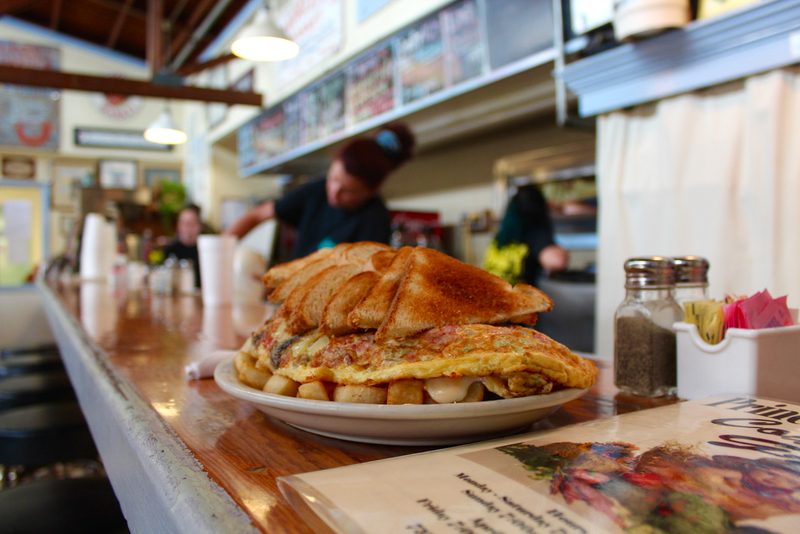 It is a massive six-egg omelet stuffed with veggies, cheese, sausage links and patties and bacon, surrounded by double orders of home fries and toast. 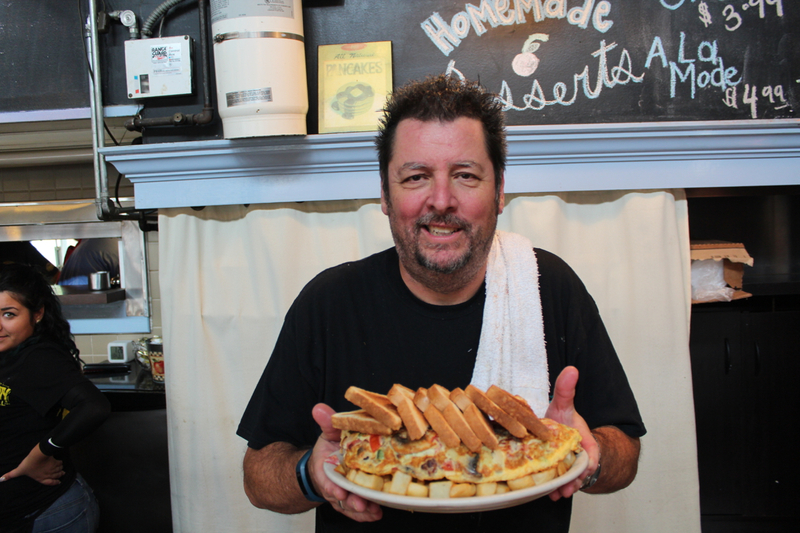 Scot Wilson, 53, has owned the restaurant for 11 years, and he said Eggzilla was just a food challenge to get people talking about the place at the Virginia Beach Farmers Market – and, of course, eating. It took off, but it wasn’t enough of a challenge. “Seven years,” server Cortney Roach, 28, replied. The carbs, it seems, stop some runs to consume Eggzilla. “It’s usually the bread,” Roach offered. “It’s a double order,” Wilson said. Scott Quirico, 38, tackled Eggzilla during a visit to the Princess Anne County Grill. Quirico, a lawyer from Northern Virginia, was in town this past month to run a race at the Oceanfront. “Any rules or anything I need to know about?” he asked. She pointed at a clock on the wall. “Let the games begin,” Banks said. “We ran a race,” his 7-year-old daughter, Cassandra, said. “We did a mile in the sand,” Scott Quirico said. “You did a good job,” Allyson Quirico, 38, told her daughter. He tackled this one with gusto, dividing the omelet, placing chunks in folded pieces of toast, which carried Eggzilla to his mouth. In comparison, his wife and child’s meals looked adorable. “You think you could finish that?” Allyson Quirico asked her daughter. Banks marveled at Quirico’s progress. “He’s only been eating 10 minutes, and he’s almost done,” she said. Then she shared a story that almost sounded like a fable. Once, two men came in together. Each ordered Eggzilla. One launched into it, but the other man took his time, taking photograph after photograph of the massive meal. “I mean, he was twirling his plate around,” she said. The photographer didn’t finish. The man who stayed on task did. Before you knew it, Quirico was done. He said the omelet was really good, noting that this isn’t always the case with meals in which size is such a notable component of the dining experience. “He finished even before me,” Cassandra Quirico said. The eggzilla is easy. I did it in right at 15mins. I probably coulda done it in 10. Nice article on a nice challenge!